A boreal forest nature reserve in southern Norway offered a unique opportunity to reconstruct past events, as scientists from the Norwegian Institute of Bioeconomy Research (NIBIO) demonstrated in a report published online ahead of print in the Ecological Society of America's journal Ecological Monographs. The trees told a story of a surge in human-instigated fires during the 17th and 18th centuries, followed by fire suppression after AD 1800, as economic motivations changed. Unlike the boreal forests of North America, which more frequently experience fires hot enough to kill most trees, the forests of Norway, Sweden, and Finland characteristically burn at low to medium intensity. Fires burn through the understory, leaving mature trees scarred, but living. The burn scars, combined with tree ring data, and historical documents, present a record of wildfire behavior in the second millennium. Together with former PhD-student Ylva-li Blanck of the Norwegian University of Life Science, researchers Jørund Rolstad and Ken Olaf Storaunet collected and analyzed 459 wood samples from old, fire-damaged pine tree stumps, snags, downed logs and living trees in 74 square kilometers (28 square miles) study area in Trillemarka-Rollagsfjell nature reserve. At 60 degrees North, Trillemarka-Rollagsfjell shares a latitude close to Anchorage, Alaska and Whitehorse, the capital of Canada's Yukon province. The pine and spruce dominated forest ecosystem has many traits in common with the forested ecosystems of interior Alaska and Canada. 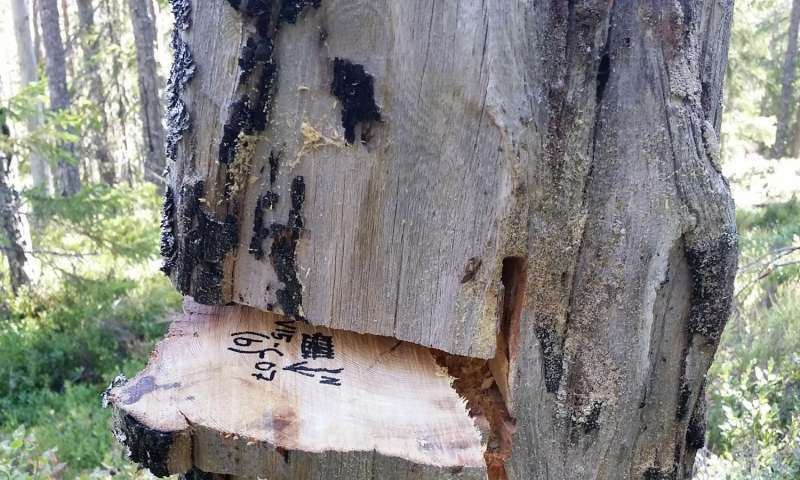 The collected samples were cross-dated by dendrochronology, a method used to date wooden samples by comparing tree rings with a known time-sequence from many other collected and dated tree ring series. In this way, scientists can determine the date and location of forest fires with great accuracy. Based on where in the tree ring the damage occurred, the forest researchers can also say at what time of the year it burned. From this record, the authors estimated fire location, frequency, size, and seasonality over the last 700 years, comparing the fire history to historical records from the National Archives of Norway, including juridical documents, diplomas, and old maps of the area and old agricultural textbooks and reports. They dated 254 individual fires from AD 1257-2009. The oldest living tree they sampled dated to AD 1515 and the oldest stump to AD 1070. Ecologically, the period from 1625 and onwards to today is probably unique, and something that perhaps has not happened in thousands of years, Storaunet said. Studies in Alaska and Canada have projected that hotter, drier summers may increase annual wildfire burn areas by two to three times by the end of the century. In Norway, the North Atlantic Ocean may temper hotter summers with more precipitation. Forest fires can be catastrophic and damaging for both home owners and the forest industry. In Canada each year, on average, 8,600 fires burn 25,000 square kilometers (10,000 square miles) of forest. But forest fires play an important part in the ecology of northern forests. Natural forests are not a continuous expanse of old trees. Forest fires create a mosaic of burnt and unburnt areas, shaping the species composition and the age distribution of the forest. Fires open up the tree canopy, letting light in, releasing nutrients to the understory, and aiding regrowth. Charcoal changes soil structure, and charred tree trunks become habitats of great importance for the biological diversity of the forest—both above and below ground. Many rare species, especially fungi and insects, depend on the variation forest fires create. Many of today's forest reserves have perhaps never been as unnatural as they are today, Storaunet pointed out. 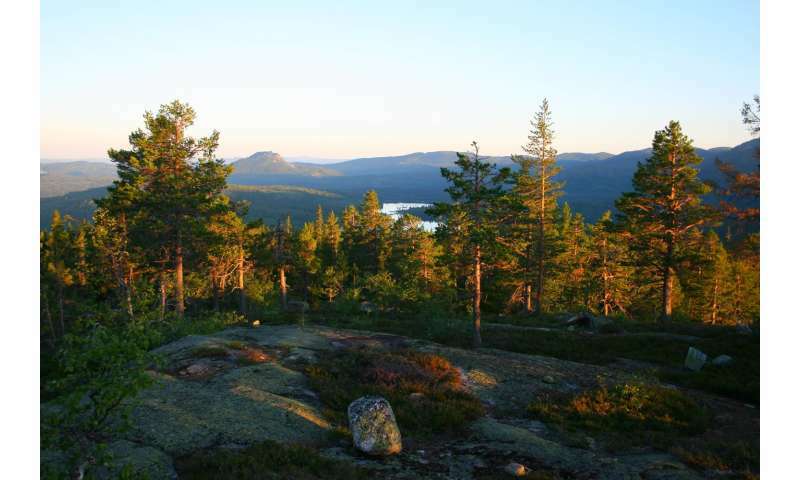 The historical studies in Trillemarka-Rollagsfjell nature reserve show that fire has been a natural, and very dynamic, part of the forest ecosystem throughout history. And this ecosystem is affected by climate, vegetation and not least the way humans use forest, Storaunet said.